Wongapitcha women carrying dogs which they hold across their backs to enjoy the warmth of the animals’ bodies, Photo and caption: Herbert Basedow, 1924. Glass plate negative. 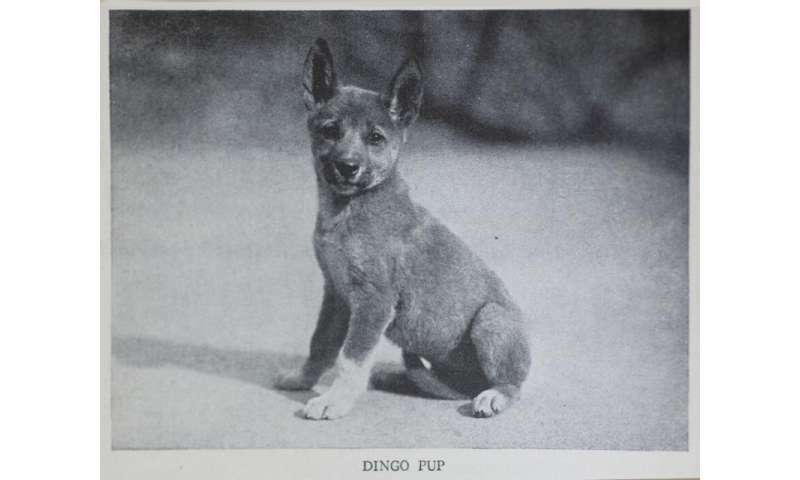 Dingo pup, 1930. Popular official guide to the New York zoological park. The female lived for seven years in the gardens, the male survived just two months after arrival. Eventually the bodies of both were transferred to the stores of the Muséum national d’Histoire naturelle and preserved for perpetuity. Notes in the museum state that early on in the voyage of Le Naturalist, before departing King Island for France, the male dingo had “been too brutally castrated because of his independent character” and these injuries eventually killed him. The taxidermy specimens remain in the vaults of the museum today.